Pay over time, on your terms. Buy your BeckerTime watch with Affirm and pay off your purchase in easy, fixed payments over 12, 24, or 36 months. Experience true freedom by paying over time. 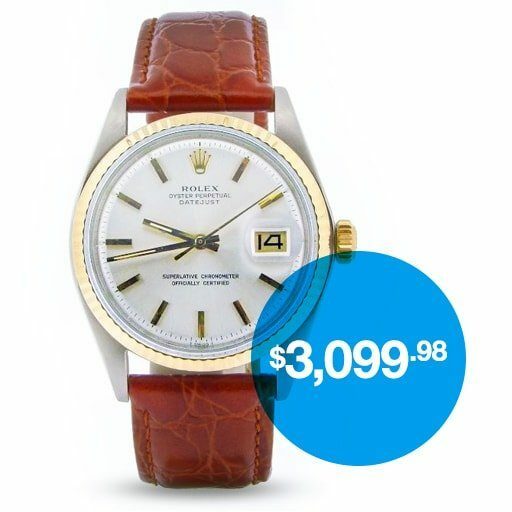 Beckertime has now partnered with Affirm to bring you more Rolex finance options for your new luxury watch. Not only do these finance options give you the freedom of paying over time, it increases your purchasing power to buy the things you love. So, take advantage of these benefits. You’ll find that Affirm is an easier, faster way of paying over time. Also, you can leave your card in your wallet. Because when you choose to buy with Affirm, you receive your order now and split your purchase total into multiple budget-friendly payments. Yes, it’s that easy! Checkout is easy. Just select Affirm and enter some basic information for an instant loan decision. There’s no card number to steal, so your account stays secure. Pick a loan that fits your budget. Choose to pay off your purchase over 12, 24, or 36 months. Buy what you love. Pay over time. Make monthly payments for your purchase with a rate between 10–30% APR based on your credit. What you see is what you pay—never a penny more. Available terms shown at checkout. These are some of the most common questions from customers when these want buy something with Financing by Affirm. Select Affirm as your payment method while checking out with any Affirm online merchant partner. Provide a valid U.S. mobile number and agree to receive SMS texts. The mobile phone account must be registered in your name. We cannot accept VOIP numbers at this time. How do Buy an item With Affirm? Cross River Bank is a New Jersey-chartered bank and is the lender for all Affirm loans. Affirm loans vary between 10% and 30% APR simple interest (0% APR is offered at select merchants). The corresponding finance charge is the only fee associated with an Affirm loan – we don’t charge late fees, service fees, prepayment fees, or any other hidden fees. We strive always to be more transparent and fair than any other form of financing. Why was I prompted to link my checking account? We hope that all of our users honor their loan agreements with Affirm. Please understand that when you take out a loan through Affirm, you are entering into a legal obligation to repay the balance of the loan. This is no different from other agreements to repay people or businesses for goods and services. While we hope we never have to do so, we reserve the right to refer delinquent accounts to collections. For any questions about this, or if you would like help paying your balance, please contact us. You may review Affirm Terms and Conditions here. What if I need more time to pay my bill? Unfortunately, we are unable to grant extensions at this time. Rest assured that we will not impose any late fees or additional interest. But a late payment may prevent us from approving any future applications for financing. I do not agree with the amount on my bill. What should I do? Please review the details of your bill at www.affirm.com/account. If you still have an issue with your bill, please contact Affirm. Are there any penalties for paying off my loan early? No, there are no prepayment penalties or fees for paying off your loan early. Also, if you pay off your entire loan before the final due date, you will pay interest only for the period that you borrowed the money. Affirm rebates any unearned portion of the finance charge for the remaining loan period. To see the total pay-off amount, go to your Affirm account and click on ‘Make Payment’. What are Affirm’s Terms and Conditions? You can find Affirm Terms and Conditions here.